Stopping using rugs for our horses has been one of the hardest changes we have made so far, in their interests. Why? Because it didn't feel like withholding the rugs was in their interests. There is no denying that most of us will make decisions for our horses depending as much on how we feel in our own bodies, as on whatever other evidence is available. So when winter draws in, and we start to load on the jumpers and the heavy winter coats, of course it feels right to do that for our horses. This brings up the second trap we fell into: what other evidence is available? Apart from anecdotes and theory, which we no doubt shied away from reading, there is the evidence under our own eyes... and that was telling us that our horses need rugs! The weather is very changeable where we are here in the South West of France. It can be 40ºC (104ºF) in the shade in the summer, and drop to -15ºC (5ºF) in the winter. In the autumn of our first or second year here, it was 19ºC (66ºF) at night, and it would have been crazy to put rugs on them, but one night there was a storm with heavy rain during the night, and afterwards the temperature suddenly dropped to 4ºC (39ºF). 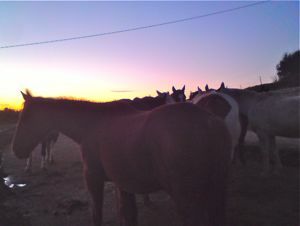 The horses were miserable and shivering, and a quite a few of them got a chill. We were annoyed with ourselves that we hadn't put the rugs on. Other times, even with the rugs on, the horses have been desperate to come in the stables - shivering and unhappy - so the very idea of not using them just didn't cross our minds. As we go further and further down the holistic path with our horses, however, we are gaining a better understanding of how living beings work. The concept of 'process' is everything. Both from the training point of view, and the healing/rehabilitation point of view. In fact, for us, the two are very much interdependent, if they are separate at all. Our recent illumination on the subject of process, is that our horses suffered when they were caught out in bad weather without their rugs because they were dependent on their rugs. This dependency meant that we couldn't expect them to suddenly cope without them. In the same way as hooves shod with metal shoes become soft and dysfunctional, their coats had become soft and their natural thermoregulation system had become dysfunctional. This also explained why they would still become cold even in the rugs, because the rugs were disturbing their metabolism to such an extent that they couldn't respond to sudden temperature drops. Not only that, when their un-rugged parts would get cold, and their natural thermoregulation set about heating them up, their body (under the rug) would get over-heated. Horses' thermoregulation functions throughout their whole body, and cannot distinguish between rugged and un-rugged parts. Currently, we have one herd with man-made shelter, and one without. Both herds have access to hay in slow feeder nets during bad weather. The toughening up (rehabilitation) process has been since the end of the winter last year, and has included exceptionally cold and rainy conditions in the spring, the usual baking heat in the summer, followed by persistent rain and temperatures as low as 2ºC (36F), and freezing weather down to -5ºC (23F) so far. So what are the results up until now? We don't know if the herds would use shelter if there wasn't food available under it, those without shelter have not shown any loss of condition or consequences from bad weather compared to those who have it. 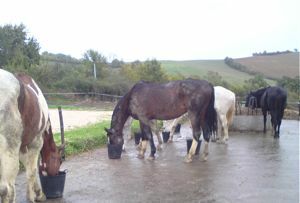 In fact, none of the horses have lost weight, and several have gained weight since the summer. They have all grown winter coats at varying thicknesses, but in general, their coats are actually less thick than when they were rugged. We believe those with less thick coats are not less efficient, they are simply 'warmer' horses. In fact they probably have more efficient thermoregulation. For example, the chestnut mare in the photo, above, who we know has a naturally high body temperature, has kept a fine winter coat so far since not being rugged. Interestingly, she was one of the horses who suffered the most from the cold when she was rugged, presumably because her natural thermoregulation was being even more derailed in its struggle to keep her cool inside a rug - it actually ended up making her too cold. 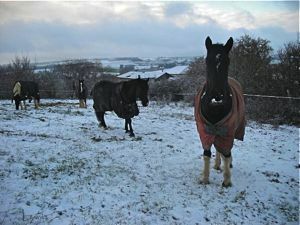 NONE of the horses have shivered, or looked miserable and tucked up from the cold so far. We find this remarkable, considering the extreme changes in temperatures, and the prevalence of wind and rain. So those who say horses can't stay warm when their coats are flattened by rain, are underestimating horses' ability to generate heat from food. The horses actually seem healthier in general, in terms of their immune system and overall body function. One horse, who has a chronic lung problem stemming from a spinal injury, always used to cough and get a snotty nose at the slightest cold or rainy weather. Since being rugless he has suffered this problem less and less - presumably his immune system is being kicked into action more, supported by his more efficient thermoregulation. 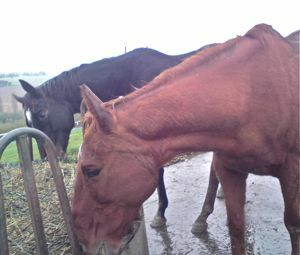 When we have worked the horses during the better periods of weather so far this winter, they have hardly sweated at all. Before they would often be drenched in sweat on their hairy areas, even when clipped. This tells us again that their thermoregulation is functioning much better than when they were being rugged. They are much more comfortable in general. They adore the sun when it is there, and they can benefit from every second of it. They can groom each other whenever they like, wherever they like. There is no rubbing on the shoulders, or nipping when the front straps are done up. We always used expensive Fal rugs, which were highly waterproof and well-cut round the shoulders, but nothing fits a horse like their own coat!! The horses' ability to raise their hairs to trap air seems to be much improved, and it doesn't look like they are 'cold' and their coats are 'staring' any more. When they were rugged at night before, their coats would start to look cold and 'staring' as soon as the heat began to go out of the day, but now they have a tough, hard, protected look, all of the time. What About the Inconveniences of Not Using Rugs? It has been indicated that horses who are using their own resources to keep warm during cold weather do not have as much energy available to exert themselves physically. Therefore, we should be prepared to reduce their workload during these periods of the year. The importance of this probably depends on the individual horse, and the efficiency of their thermoregulation. 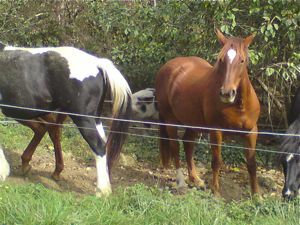 Also, it is likely that the more habituated a horse becomes to self-heating, the more energy they will have available for working, but it is something we should be careful to take into account when asking the horse to work in the winter - the best way is to use your intuition to know whether it feels right to work your horse or not. Some people see this as a major disadvantage to keeping horses rugless, but it's just another of those choices we have to make between putting our horses' natural well-being first, or prioritizing our own desires. In our experience, it never does horses any harm at all, in terms of their training progress, to have a good period of time off every year, as long as they are living a natural lifestyle with freedom and social stimulation. Above: horses encouraged to do their own exercise on a Paddock Paradise system. Our horses have to make a fairly long journey round the lanes between hay and water. The other big disadvantage we always used to use to justify rugging, is the inconvenience of horses getting covered in mud, with the extra grooming time needed if they are to be worked. Where we live, the soil is incredibly sticky clay, which is very difficult to remove when the horses roll. Nonetheless, we haven't found this to be much of a problem since going rugless this year - if anything the horses roll less (probably because they are not hot and itchy all the time), and the rain often washes them off to some extent. The most time-consuming parts to groom are the legs, head and neck, and these are not normally protected by rugs anyway. 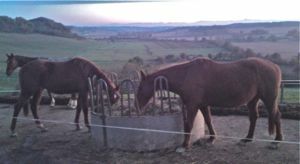 Part of being open to the process of 'going rugless' was releasing our own need to humanise and worry about our horses. We were comparing ourselves to them, but our body mass, our skin thickness, lack of coat, and type of metabolism is in a completely different ball park from horses. We evolved in a tropical climate, whereas horses evolved on the Asian steppes, with extreme differences of temperature between summer and winter, and very little shelter. That being said, some people have toughened themselves up phenomenally through exposure and habituation, so maybe we humans should be going more down that route, rather than dragging horses further towards the fragility and artificial dependency on comfort that we believe is so beneficial! Promoting a dependency on rugs instead of allowing the horse's natural ability to cope with harsh weather to function is very similar to riding in a way that encourages both horse and rider to depend on the reins for balance, instead of using their own inner postural resources. In any aspect of the body (and the mind) whatever we do not stimulate does not develop and remains weak. For example, when metal pins are used to help reconstruct a bone fracture, over time the bone supported by the pins (although it heals) becomes less strong and dense, because the pins are compensating for the weight bearing. This kind of situation can lead us to believe that the support is a necessity, because it has become so. 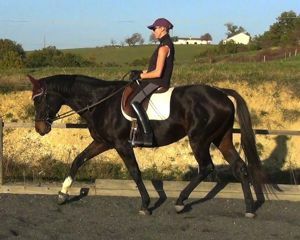 When we have been used to depending on the reins to control the horse and to feel balanced and secure, then it can feel like there is no other way, and whenever we let go, the horse seems to prove this to us - perhaps by hollowing, speeding up, not going where we want him to. However, if we give ourself and the horse the time to find another way, by letting go of the dependency, then everything can change. 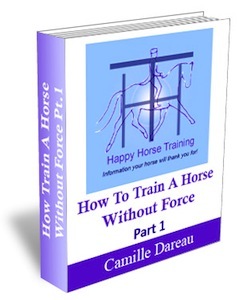 It will become possible, indeed necessary, to find a different way of maintaining balance and control within our own posture, and this will give the horse the chance to do the same. 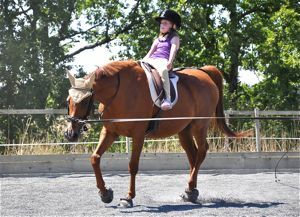 The young rider in this photo is being given the opportunity to find her own balance without the reins right from the start! Obviously, we have to work hard at learning this new skill, and find the right advice to follow, but as soon as the dependency is dropped, the door is open to change and liberation. Keeping horses naturally is to a large extent about liberating them from the constraints of the artificial lifestyle we have become used to imposing on them. 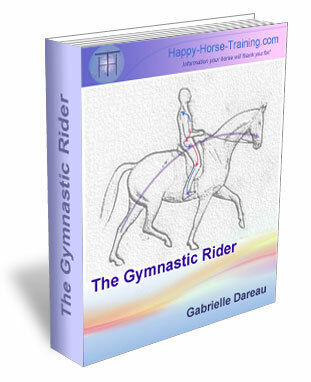 Good riding and training is about liberating the horse and rider in motion from the constraints of imbalance and resistance. Both result in fulfillment and joyful experiences. That's what inspires Happy Horse Training!